01/09/01 Welcome once more to the Mighty World Of Marbles !! A slow day - here's a few more of Foundry's new 'Revenant Elves' figs in the meantime...Not convinced about these - they are nice sculptings etc but I guess the subject matter doesn't appeal. Perhaps Deputy Nuddster's kinda thing ? Its very 'Vampire'. Definitely not anything I'd get except as collection items, but for all that they would be worth it for that. I just read that and it makes no more sense to me than it probably does to you. Uuur Monday hangover. What I mean is I could well end up buying those just as collectors pieces, cos I like them. Mmm. But... they're really angular this time! OK well with the old Colonel away for an important meeting with Generàle de Zastre it falls to me as ranking officer to bring you the latest figure news. The Colonel's notebook says something about "Celtos" under an unusual sketch (looks like a bizarre new method of interrogating messenger boys, most unhygeinic) and I can only assume he means this. 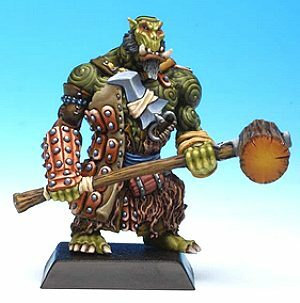 Should be of interest to the Uncl (though keep in mind his thoughts on figure continuity across ranges), the first of their new Orcs. 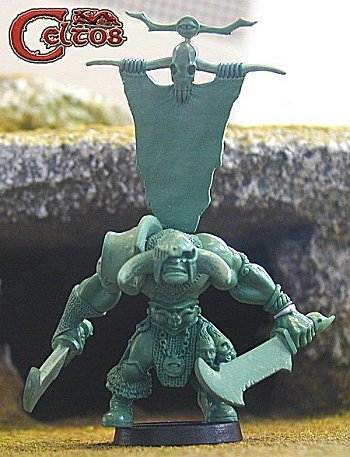 Balor of the Dreadful Eye (apparently). Hopefully the Colonel won't recieve to hard a dressing down, but I gather the General is rather displeased with his apparent involvement in the Bankok Butler Scandal. 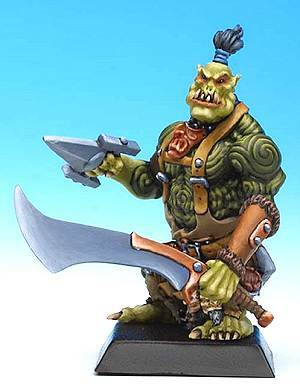 Nice enough as yer large beefy type blokes go, but rather 'mannish' fer an Orc woodjant yer say? I'd rather have some of them meaty eyetie fellahs I think. I can see an ongoing bugbear coming on, maybe to turn into a long-term rant. You have my sympathies, but then I have trouble getting figures that look mannish *enough*. Well, there was I wondering what to put in Masterworks #44 when this little beauty arrives! 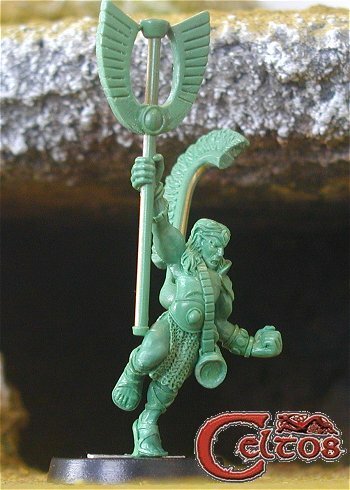 The long (long) awaited new range of Foundry Celts begins! 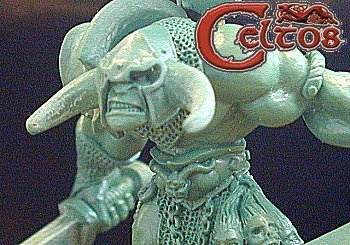 Trouble with Celts is all the historical manufacturers started off doing Celts and romans ages ago and then moved on to the more exotic types so all the old moulds are crap now (though of course Foundry's were still the best, the cheeky beggars). Other manufacturers have brought out great new lines (and GB have beaten Foundry to the post by several months but have failed to advertise their new figs anywhere! I'll have to paint and photograph my own ones to show you...). 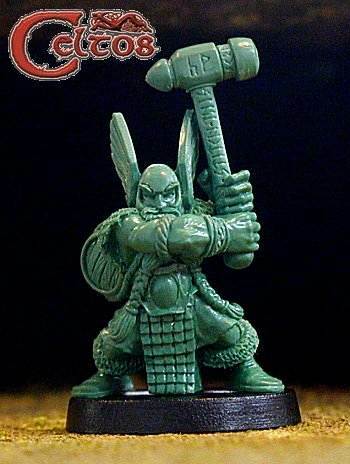 But now... drools.. froths... Wargames Foundry: Celts!!!!!! Ooops sorry about that. 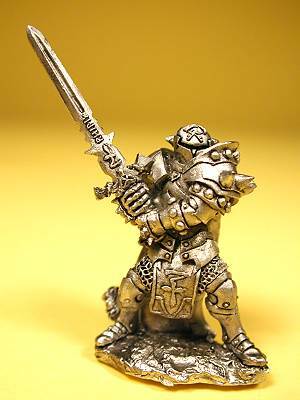 The monthly limited edition (#spits#) might be of interest to some of you too, a preview of the Foundry Fantasy Dwarves. I hope these pics don't literally mean theres only 3 cavalry in an £8.50 pack though. Surely not? Colonel?? Hmm, prejudice on the lists is it? Bring back the Col., all is forgiven. 10/09/01 With the Col. still AWOL it falls to me to thrust some new mini's forward into the lime-light. 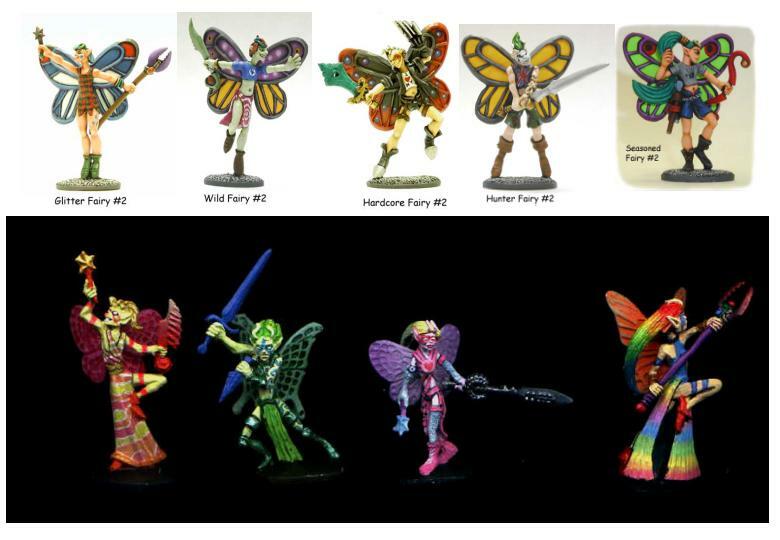 In order to tie in with the latest review offering, I thought I'd punt out some piccies of the Fairy Meat minis. The original releases to be honest were a bit 'chiselled' and quite pants, though the spanking paint jobs done on them (the bottom set with the black background, painted by Scott somebody or other - http://members.aol.com/pazuzu23/Figures/figures.html)do make them look quite cool. 14/09/01 Thankfully Col Marbles is back at the Controls so you can all rest easy in yer bunks ! Thank to 'Doc' Ashton MD & UnclEvl for 'filling in' (sort of!) during my absence. 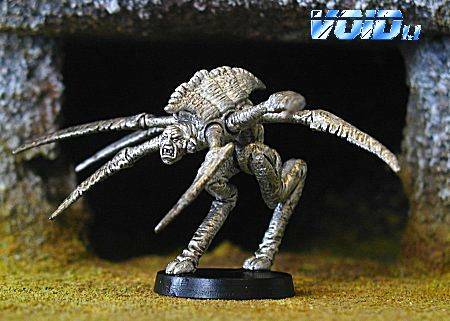 A new race of Spider type space dudes being released by I-Kore !!! Spoiled by the rather poor humanoid face in my opinion. 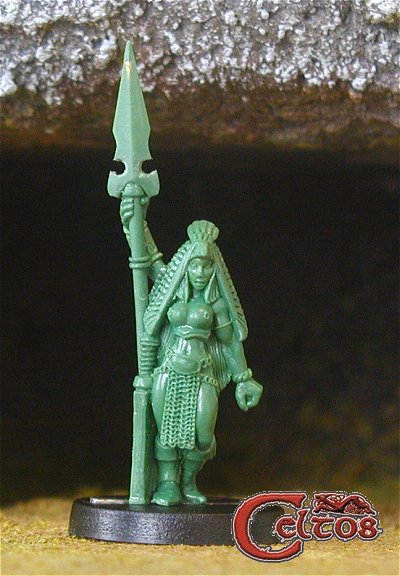 Here's some of the new Elves from Foundry - q. nice, but not really my kinda thing.. 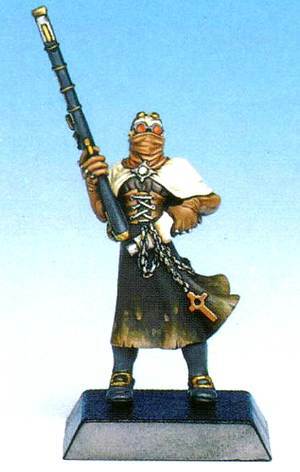 I do like these figures and admire Foundry for taking a different tack with their concept here. Agreed, these are fine and flavoursome figs, and should appeal to collectors, rpg-ers and (to a lesser extent) wargamers alike. 1. The old 'they-don't-fit-with-any-other-figure-ranges' argument we have been into before. Thats a bit more unfair to invoke here though. I mean they are clearly elves, so even though they are differently attired to what some people might have they shouldn't look too silly in an army (in their own unit or as personalities I should think). 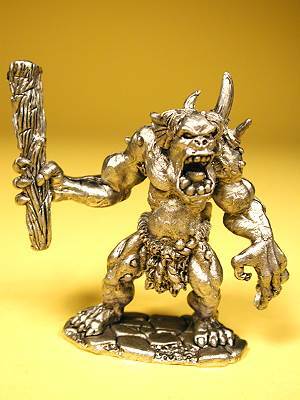 Its not the same as people releasing sets of slightly ugly humans and calling them Orcs, and I certainly wouldn't want Foundry to just reproduce what other companies are already doing in spades. 2. These seem much more like RPG figures than army figures. 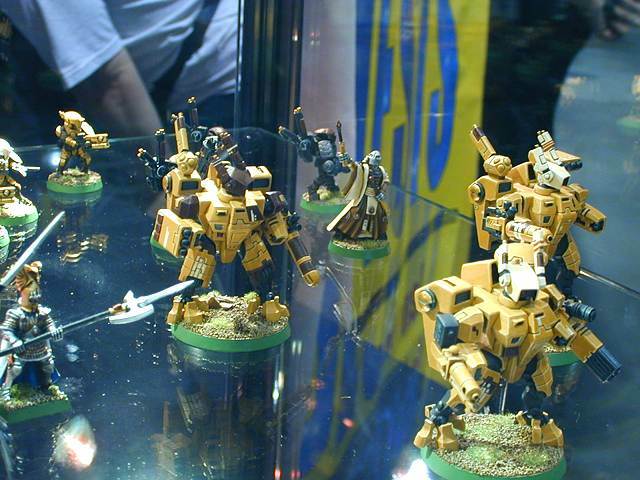 Its a miniatures masterworks, not a wargames miniatures masterworks dude. Don't get me wrong, nothing wrong with that per se. They're still very nice figures, beautifully proportioned, excellent posing, bags of character - just not sure of their 'usefulness'. Not very useful to you as an Orc commander anyway I would think..? 17/09/01 Todays pic is some new 'Dark Age Irish' from Gripping Beast (wish they had a website!). 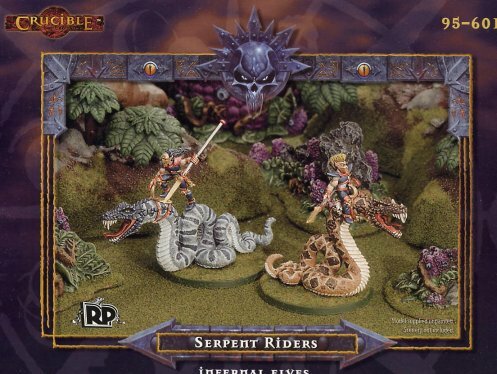 The picture isn't the best (scanned from Wargames Illustrated ad) but u can see that the figures are excellent as always - tempted to get the hounds for my Wood Elf army. A must buy for 'Doc' Ashton MD's fantasy Celtic force surely ?? 18/09/01 Col Marbles missives are 50 today ! 19/09/01 Here's the latest from Copplestone Miniatures, Zombie Troopers, along with a new Foundry Dwarf (their mthly ltd ed.) which is a taster for the new Dwarf range. Yeah, already seen these. Quite a laugh. 20/09/01 Finally Reaper Miniatures make some decent figures !!!! Is that an Orc? Who cares, very cool - dig the sideburns, very 70's chique. 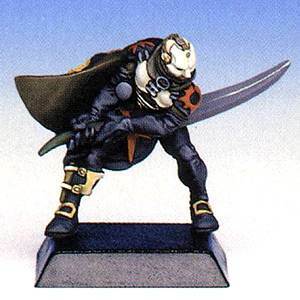 24/09/01 A couple of new mini's from I-Kore - an Elven wizard for the Celtos fantasy line & a new 'Koralon' from VOID. I think. 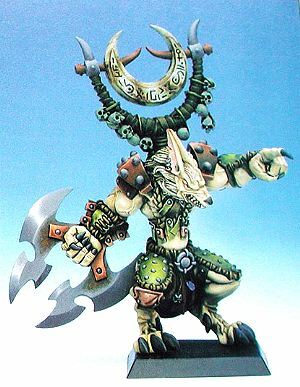 Like the Elven wizard (scratch the back banner perhaps, maybe change the standard for a weapon or summat) - could be some decent fodder there for yer wood elf army at last mebbe. Todays new mini's come from Copplestone Castings http://www.geocities.com/gisby.geo/fw25.htm with some excellent 'Predator' figures hot out of the moulds, (there are also some cool new 'Men In Black' out btw). 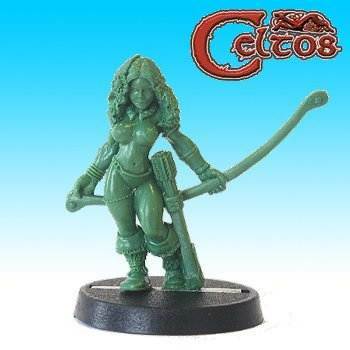 26/09/01 Couple of new Celtos figs today. The archers a good 'un. When these gonna be available then? 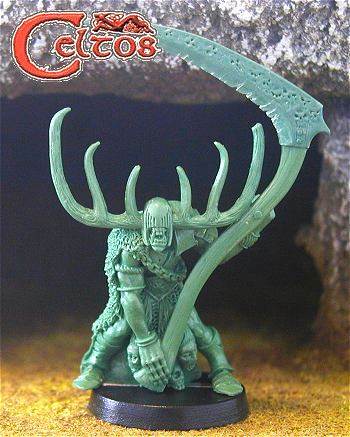 Good question as to where to get any of these Celtos figs - last time I looked 'Playin' Games' who do VOID had no Celtos. Orcs Nest don't do 'em. May have to mail order ??? 27/09/01 Ok its all pretty quiet out there today (apart from a not very good new Celtos mini) so here are some more Confrontation figs !! Cowabunga !!! Moral: don't call Baz an arse an expect to get all your piccies on time. Actually..... I don't remember saying anything about Bazzer's arse, despite him showing it to me (against my desire). Blimey. I thought it was just me. Maybe we should start a support group or summat? 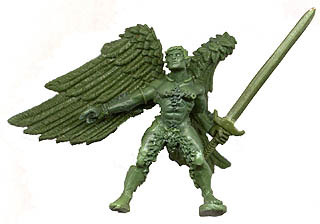 28/09/01 Todays mini is a cool new 'Winged Elf' forthcoming from Foundry as part of their new Elf range. V. nice indeed !! Whoa! What is that supposed to be? Hmmm, interesting anyway. Possibly some room for manouvre for inclusion in Maynard's army as some sorta angelics mebbe as well. A pointy eared, tree hugging, lily eating elf with wings?!? Anyone can plainly see that it is an attempt by the lowly Silvan to disguise themselves as one of the 11th Kingdoms elegant, graceful and mighty Angelics. This sacrilegious and blasphemous affront to the 11th Kingdoms religion shall not go unpunished!!! For far to long now have the Silvan Race been such a disappointment... both on the battlefield and off it. 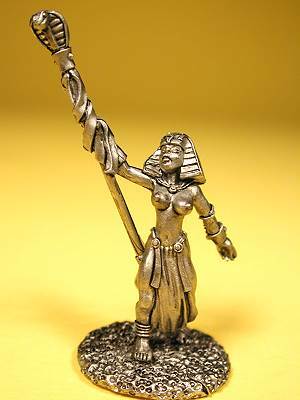 ... still it is a nice mini, wouldn't mind having one of those for my army, that way I can eventually have a whole units worth of the little beggars!!! 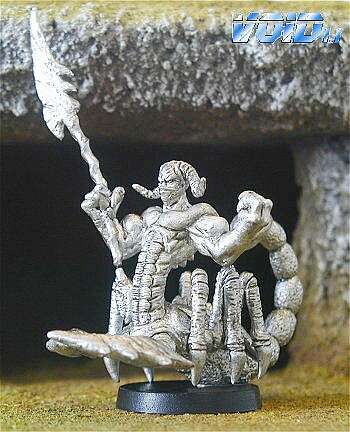 Mmm... *droooool* Nice enough detail, big enough sword, though I'm not too sure about the whole fuzzy growth thing on the poor fellers legs, very unsightly and may be too "elf" looking for my tastes once it's painted up and stuff. Speaking of which... has anyone played a computer game called Arcanum??? Actually, the full title of the game is Arcanum: Of Steamworks & Magick Obscura. Excellent game... highly recommend it. Though I'm not sure if it's out yet in the UK. - Maynard. Oh. Scrap that angelics idea then. Not enough expletives in it for my tastes. In fact their omission means I'm not even sure if it qualifies as a rant. More a tirade really. Top notch I have to say. Maynard is cyan on the webpage btw Baz.